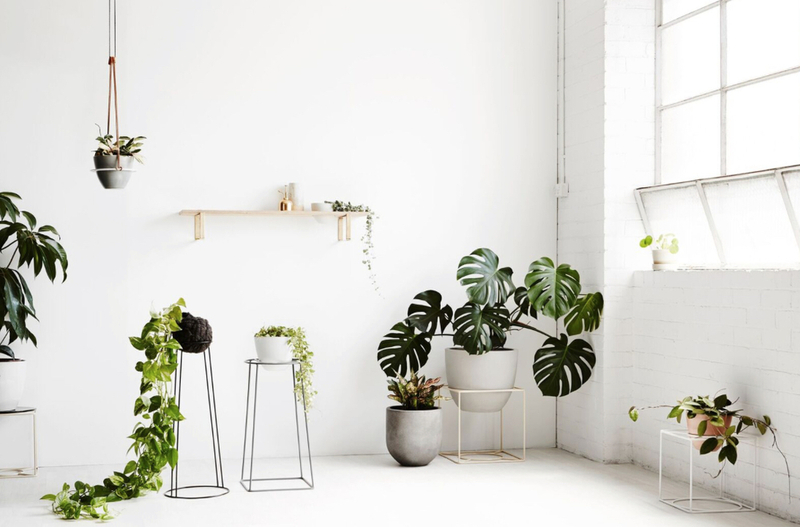 There’s no denying that indoor plants are a hugely popular design trend right now, but why are we suddenly so drawn to them? With Australians now spending longer than ever before indoors, it is little wonder that we want to have our own slice of nature around. Whether it’s a small plant on your desk or a Pinterest-worthy fiddle leaf fig in your living room, indoor plants have been linked with increased happiness and lower stress levels. Granted, this is a very subtle type of happiness, but we do believe these mood-boosting properties go a long way to explaining why we have become so enamoured with indoor greenery. A 1989 study by NASA, which is still widely cited and respected today, also found that houseplants are great for filtering the air. Indoors, chemicals seep into the air from cleaning products, plastics, synthetic materials, paint, adhesives and floor or furniture wax. Depending on where you live, chemicals from car exhausts, pesticides and tobacco smoke may also be present in the air, and in offices, printing inks contribute to the mix. Thankfully, the levels of chemicals in our air are generally pretty low, but NASA’s research did find that most common indoor plants are effective at removing toxins and pollutants from the air. So if you have been thinking of occupying an empty space with a plant, there is good reason to do so. Here we share our ten favourite indoor plants and how to keep them thriving. The peace lily has beautiful foliage and the bonus of flowers. It prefers low light and would much rather be under watered than overwatered. The peace lily’s broad leaves can be dust collectors, so give them a wipe every now and then. If you have cats or dogs, steer away from this one, as it can be poisonous to them. Based on looks alone, you wouldn’t think that the happy plant and the Madagascar dragon tree were related. Unlike the happy plant, which has thick glossy leaves and plenty of foliage, the Madagascar dragon tree is far more slender. For this reason, the svelte plant is well suited to contemporary and minimalist spaces that could do with a little bit of life. It only needs watering once a month and likes sunny spots beside a window. Pruning the top will help you manage its height and keep the plant nice and bushy. If you don’t have much experience in caring for plants, devil’s ivy is a good place to start. It is hardy and a great communicator that will curl its leaves up when thirsty, letting you know that it’s time for a drink. This plant will trail if it has something to climb, otherwise put it in a hanging basket or on a shelf where foliage can cascade down. This is another one to avoid if you have pets. Part of the succulent family, the string of bananas is another plant that will cascade over the side of a pot. It gets its name from its leaves, which look like tiny bananas upon close inspection. Being a succulent, this plant does like a good amount of sunlight and only an occasional watering. Give it a trim every few months to keep the plant lush and thick. Note: If you can’t find string of bananas in your area, try looking for string of pearls instead, as the two are quite similar. This is one of the most popular plants right now, both indoors and outdoors. While the fruit salad plant is generally an outdoors variety, it will survive inside in a well-lit area. Look for a spot inside that receives gentle light, as harsh light can scorch its leaves. Plant this species in a large pot with a stick for support. Another variety with a feel-good name, the happy plant is a hardy species that won’t demand much from you. This plant was wildly popular in the 1970s and stories of happy plants that are still alive from this era are not uncommon. Keep them out of direct sunlight and allow them to dry out between waterings. This evergreen tree stands tall, making it ideal for larger spaces. It is content indoors and will be happiest in a spot where it receives some light and watering only once the soil has dried out. Prune your weeping fig regularly to maintain thick foliage and to control its height. This member of the fig family is hugely popular right now and it will thrive indoors. Just like its cousin, the fiddle leaf fig also likes indirect sunlight and will do best if you let it dry out between waterings. This plant can grow quite tall, so ensure you have enough space for it. This is another houseplant that is often associated with the 1970s – a golden era of indoor greenery. These trees can grow quite high, which is one of their most appealing traits for indoor gardeners. Position your umbrella tree in indirect sunlight and ensure you water it frequently, as it will flourish when its soil is constantly damp. Most of the plants we have listed here are hardy and relatively easy to care for, but the maidenhair fern is slightly more finicky. Its bountiful yet dainty foliage is, however, well worth the extra effort. Place maidenhair ferns in a well-lit position and don’t let them dry out. If you think you may forget to water it, consider planting your fern in a self-watering pot that will let it take a drink at its own leisure. Most houseplants prefer to dry out before being watered. Try to avoid placing plants in the direct flow of an air-conditioner or heater. Aside from cactus and succulents, most indoor plants do not like harsh, direct sunlight. Use good quality potting mix that will provide plenty of nutrients. Repot plants every one or two years to keep soil healthy and give plants more room to grow. Dust can make it harder for large-leaf plants to breathe, so wipe them over with a damp cloth once a week. What are your favourite houseplants? We’d love you to share your indoor gardening experiences with us in the comments below.